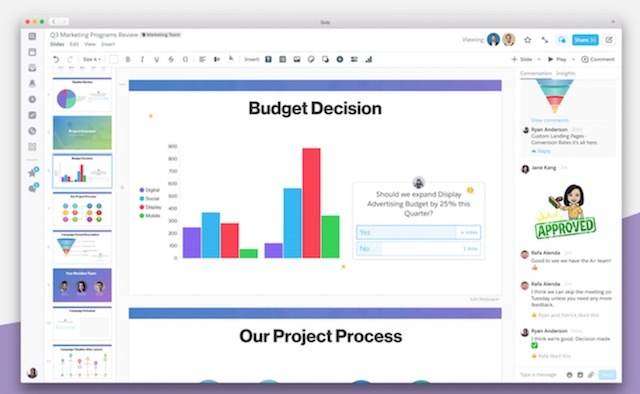 Salesforce Quip has added Slides to its suite of products. The addition of Slides makes Quip more complete as it already has a document and spreadsheet platforms. The Slides product enables users to see analytics around the slide decks that you have created such as which co-workers opened it up and engaged with it. Slides was in development for more than 18 months, according to ZDNet. Quip CEO Kevin Gibbs said that Slides was designed for the 79% of users who make slide decks that never get seen on bigger stages. Usually, these slide decks are shared with internal teams or with single customers. “This market is underserved,” said Gibbs via ZDNet. By having Quip Slides’ interactive tools built into the software, it could enable teams to skip meetings. “If we can find a way to make slides more interactive there’s an opportunity to skip a meeting and get an hour back,” added Gibbs. Slides will also have chat built-in along with commenting, charting, interactive feedback, and engagement insights. Plus there is also integration with GIPHY for animated GIFs. And polling is also available. Quip Slides is available for free users of the service along with paid corporate users. Slides will be connected to Quip’s spreadsheets along with Salesforce data. This ensures that the data updates in real-time. And Quip is going to integrate its apps with storage services like Dropbox and Box. Gibbs acknowledged that insights in Slides could create engagement tension though. For example, managers may expect the folks who report to them to read the slides that they send out quickly in order to follow up with action items. Gibbs took the position as Quip CEO last year after the company’s previous CEO Bret Taylor was named Salesforce’s chief product officer. Quip was acquired by Salesforce in 2016 for $582 million.